“I’ve got to find my wife and baby,” Johnny Roland said as a massive inferno whipped through the Oakland-Berkeley Hills on a dry October day in 1991. Twenty-five years later, Roland can recall the intense heat and sheer panic. But this passing exchange with a Daily Californian reporter has since slipped his mind. It took several hours, but Roland finally located them at a store on College Avenue, away from the fire. Roland’s family was safe, but when the fire was finally contained about 10 hours later, his house was one of about 3,350 homes and apartments decimated. Picked up by the Diablo wind from the east, the fire spread rapidly down the side of the East Bay hills. At its peak, a building caught fire every 11 seconds. The firestorm left the scorched hills unrecognizable. When Peter Scott, another survivor, returned to the site of his Oakland house in the hills with his family, the experience was surreal. Scott’s mother had been in the house when the fire started, and family began combing with their fingers through the ashes for any sign of her. Even her metal knee replacement would have provided solace in the mayhem. The conflagration took 25 lives. Scott’s mother was one of them — the fire had burned so hot that it reduced the stainless steel piece to nothing. Injuring 150 and leaving 5,000 without homes, the fire destroyed 1,520 acres and caused an estimated $1.5 billion in property damage. “It was apocalyptic to see the entire hillside on fire. … Being there to see that much fire destruction, you just can’t imagine that,” said Berkeley Fire Department Chief Gil Dong, who had been with the department for about a year and a half at the time of the fire. “If you haven’t lived through seeing an entire hillside on fire, then you won’t have the same appreciation for why we need to be vigilant with fire prevention,” he said. 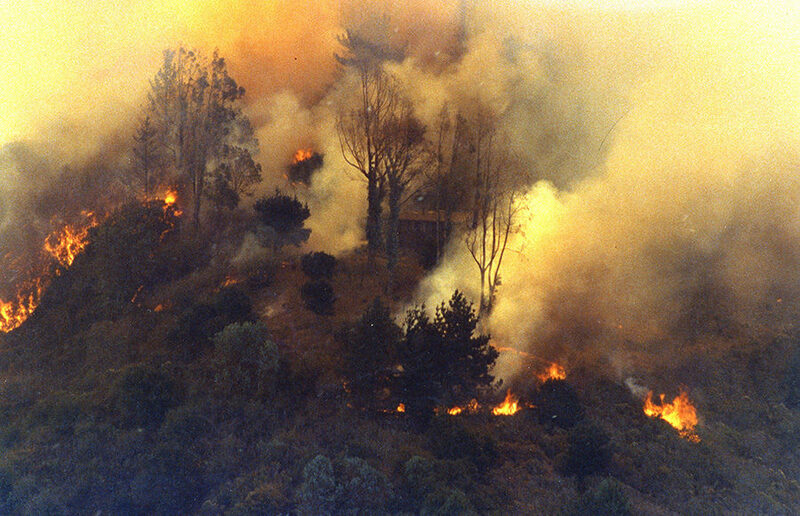 The 1991 Oakland-Berkeley Hills firestorm remains one of the worst wildland urban fires in U.S. history. On Oct. 20, 1991, Oakland resident Jon Kaufman was in his yard when the sky became dark. The day before, local firefighters had contained and were monitoring a small fire at the bottom of Temescal Canyon. But early Sunday morning, a combination of dry heat and high winds rekindled the grassfire. “There was a person there observing it, a firefighter, who mentioned immediately on the radio, ‘Oh there’s a spark out, I’m going over to get it,’ and all the sudden he said, ‘I’ve lost containment,’ ” said campus fire science professor Scott Stephens. At the time, he had just started his studies in wildland resource science as a UC Berkeley graduate student. By midday, chaos ensued. Evacuees in both Oakland and Berkeley fled the hills in cars and on foot, with residents gathering at emergency shelters and calling family members. Within three hours after the initial spread, the fire had leaped up the concrete barriers of Highway 24 and crossed all eight lanes, continuing west. The inferno barreled down the hills toward Kaufman’s house on Alvarado Road, but a nighttime change in winds sent the embers and ashes back into the burn area, sparing Kaufman’s house and the Claremont Hotel — a Berkeley icon and massive five-story wood structure that many feared could have ignited hundreds of other spot fires. His neighbors in the East Bay hills did not fare as well. Dozens of chimneys lined the winding streets like tombstones, sometimes the only sign left of the houses. When Nancy Mennel and David Kessler fled their Oakland home, they had no idea only 3 feet of rubble would remain when they returned two days later. Though they would later rebuild their home, Mennel said that in the days that followed, the couple found themselves buying basic necessities once taken for granted. Then there were the months and years of putting lives back together. The meetings with the insurance company, the meetings with design architects. It would’ve been unbearable if it weren’t for a supportive community network, said Oakland resident and survivor Sue Piper. “The saving grace for us was recognizing that you could lose all your stuff but that’s just stuff, and what is important are your relationships and also knowing that we weren’t alone,” Piper said. But not everyone chose to stay in the East Bay hills. Roland and his family moved out of Alameda County soon after, and he hadn’t returned to Oakland since. But a couple of months ago, Roland — who lives in Pleasanton, California, now — visited his old house. A five-year drought had left the East Bay hills’ abundant shrubs and vegetation bone dry. Back then, building codes allowed houses in wildland areas to be built with wooden roofs. Efforts to reduce vegetation had been hampered by budget constraints. The winding roads and staircases that give the hills their quiet charm made emergency evacuations difficult. When the inferno swelled, the local fire departments were not ready. After the 1991 fire, Dong said, legislation was passed requiring that agencies improve coordination for large-scale incidents crossing multiple jurisdictions. From the surrounding areas, 440 engine companies and more than 1,500 firefighters responded to the wildfire, but teams were overwhelmed by the firestorm and unable to stop its progression until the winds changed. Ashes and small pieces of wood could be seen floating across the bay. At the time, Oakland fire hydrants required hose fittings that were a different size from the rest of the East Bay cities’ fittings. When mutual aid companies arrived to battle the fire, Dong said, many could not hook up to hydrants to distribute water. Hydrants have since been standardized across the state. There was also no real emphasis on wildland fire training before the 1991 fire. Dong said BFD now actively monitors the hills’ weather, temperature and humidity, and it puts firefighters on patrol during high fire danger days. In addition, the department has sponsored dozens of trainings for local residents to learn how to put out smaller fires and has encouraged homeowners throughout the area to create defensible spaces around their houses, clear of vegetation. Stephens still worries that residents of Oakland and Berkeley have already forgotten the destruction the fire left behind. Oakland hills residents passed a 10-year parcel tax in 2004 to provide preventive fire programs managing vegetation on public property and acquiring extra patrols on high fire danger days. In 2014, a vote to renew the tax failed. Piper, who has been an active community member advocating for wildfire prevention, said that when the money runs dry in June next year, residents need to be proactive. In California, October is a dangerous month for wildfires. Virtually all of the most property-damaging wildfires in the state have occurred in October. While strides have been made to regularly clear dead trees and brush in the hills, today’s wildland landscape and California climate are markedly similar to the conditions that made the East Bay hills ripe for a firestorm. The state is in its fifth year of drought, just as it was in 1991 when the fire broke out. In addition, efforts to further fire mitigation projects have seen setbacks from local residents. FEMA recently pulled funding from UC Berkeley and the city of Oakland programs that would have removed eucalyptus trees, which Stephens said exacerbated the 1991 fire through spot fires caused by wind-swept embers. When they took off, the ashes and small pieces of wood could be seen floating across the bay. Roland remembers leaving a church in Richmond when he first learned of the fire raging through the hills. The congregation had just finished a gratitude exercise in preparation for Thanksgiving. In a booklet, Roland wrote the 10 things he was most grateful for that day.